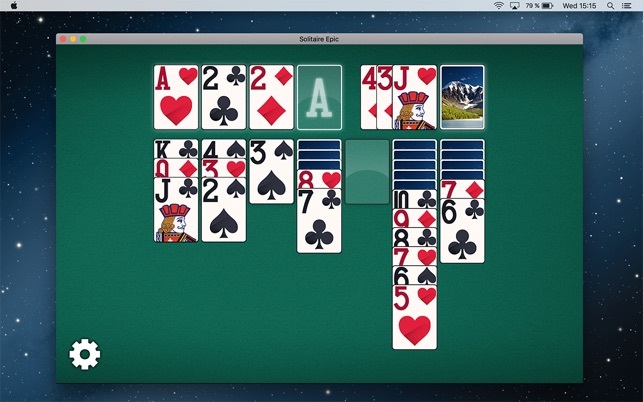 Solitaire Epic is a free solitaire card game. 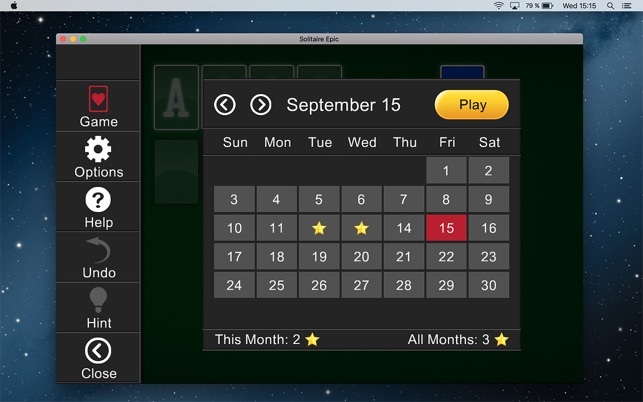 This premium quality game is designed to deliver the best solitaire experience, focusing on keeping things simple, clean and easy to play. Previous Updates: 1 new card front design, 2 new backgrounds. I have tried several different Klondike games over the years and averaged about 12% as a win rate. This average was developed over several years and thousands (perhaps 4500) of games from different vendors. Based on my first couple of months playing this product I have one just one game out of 25 or so. Maybe this is just a “black swan” event, but it makes me wonder, particularly when an option is “winnable” games. If the developer can present game he assures are winnable, he probably has the skill to make them more difficult than a statistically correct game. Aside from that, the option selections bar on the right hand sicde of the paying layout toggles on and off and opens each. game in the hidden position. I wish it was always on. Just to be clear, I will continue to play this game to see if remains so hard to beat. From a couple of rounds played, it seems to work pretty well, but I just don’t enjoy playing any Klondike game that will only show cards with one giant Heart, Spade, etc. on them. I want to see 5 heart pips on a “5 of Hearts”, 8 club pips on an “8 of Clubs”, etc. It’s not just a style thing — I’ve been playing Klondike in card form and on the computer for over 40 years, and I’m used to being able to scan over the table very quickly to assess my options. When each card displays the correct number of pips, you can do that in a glance, without having to pay attention to the numbers in the corners. Without pips, you constantly have to double-check the numbers on every card…really annoying. 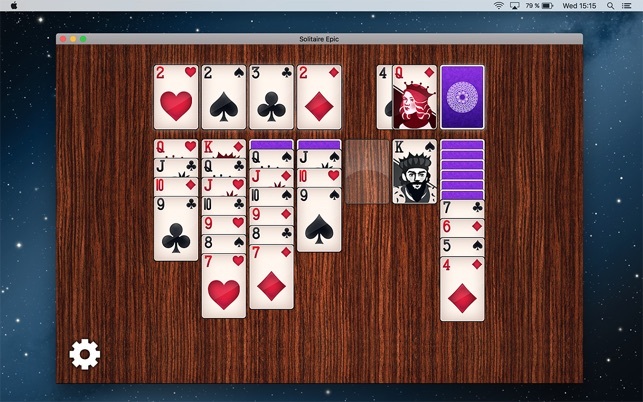 I have played other solitaires that are hard to win. 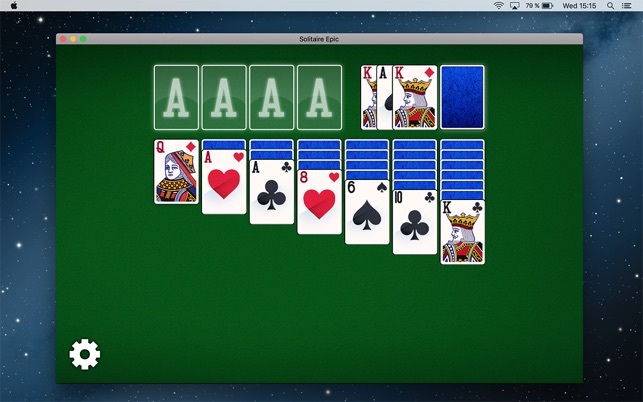 With this Solitaire Epic I won five games in a row! One after the other! It makes you feel great. I had m y wife play it too and she won the first game and came running and jumping because she had won a game at the first try. I guess that the more difficult ones will not let us winn without “a fight”. That is ok. But to win solitaires, even if their are winnable, it requires certain expertise and some intelligence. Also, the mere playing a game makes your mind work, and that makes it worthy.